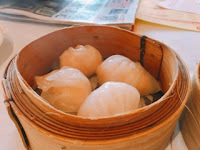 I may have found a new go-to place for dim sum: Fancy Chinese Cuisine. 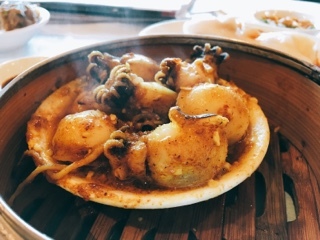 However, I’m hesitant to label the restaurant with the title as its predecessors over the last few years gradually were replaced – mainly as the wait times during their special pricing hours became unbearable. Fancy also has the special (between 8:30am – 11:30am or after 1:30pm) where anything classified as small, medium or large is $2.98. 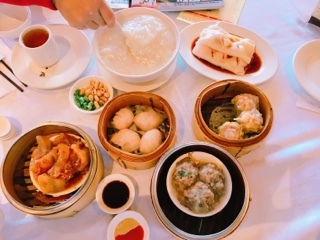 Nonetheless, even if you dine during the prime lunch period (11:30am – 1:30pm) prices aren’t much higher: medium dishes are $3.28 and large/special sizes a mere $1 more for $3.98. These relatively stable prices means there’s less people rushing to get in before 11:30; most visits we were seated within a short wait when arriving before 10:00am. Finally! A place that caters to my impatient personality. Fancy also executes dim sum in an OG fashion. Sure, they’re not shaped into Instagram friendly flowers or animals, but they do offer strong flavours and traditional elements. 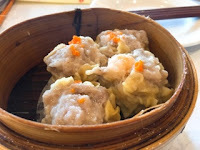 The shrimp dumpling (har gow) and pork dumpling (siu mai; both L) are solid versions of the favourites – the shrimp not overcooked and the wrapper relatively thin on the har gow while the siu mai has the customary juicy pork mixture studded with shrimp. 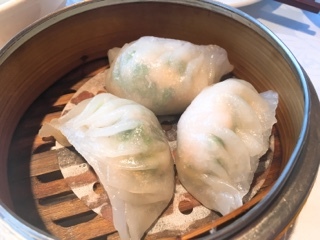 The shrimp and chives dumpling (L) is also decent: a large size and the chives adding a herby element to the dumpling. 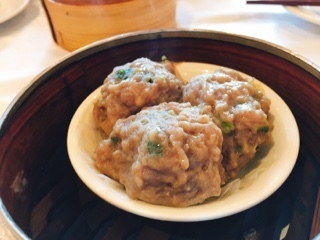 Rather than layering peas or watercress under the steamed beef ball (S), the chef opts for a sheet of parchment paper instead, which makes separating the balls a breeze. The recipe could use a bit more coriander, but the consistency was bang on. 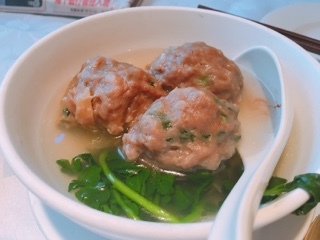 Personally, I prefer the beef ball Chew Chow style (M), essentially the same meat balls but served in a broth with watercress. The soup is your typical salty MSG version, but keeps the beef warmer and moister. 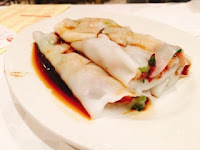 With seven fillings available for rice rolls, there’s something for everyone. 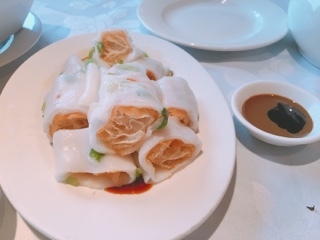 Having tried the steamed shrimp (L) and BBQ pork (M), they’re both good: enough ingredients so each bite has filling and slits made to allow the soy sauce to permeate further. 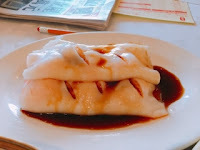 Although the rice sheets are on the thicker side, the wrapper was still silky and soft. 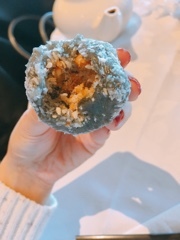 On the other hand, the fried Chinese dough rice roll (M) was terrible, where the dough fritter was either stale or so over fried that it shatters into oily shards. 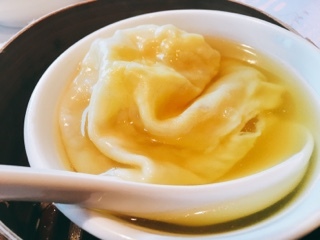 Similarly, the conpoy with dumpling in soup (L) was a disappointment. The dish was overcooked rendering the shrimp into small bites of rubber and the actual wrapper mushy. 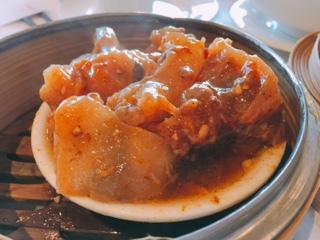 Normally considered an extra-large dish at other restaurants, you can still order the beef tendon in special sauce (L) at the special pricing. Tendon has a soft chewy gelatinous texture that’s an acquired taste – even for myself, it wasn’t until my adult years that I started enjoying the dish. Fancy’s “special” sauce is a cross between the sweet red sauce used with chicken feet, a spice (perhaps curry? ), and tons of garlic. The dish certainly doesn’t lack flavours. Similarly, the cuttlefish with curry sauce (M) is one of the more powerful ones I’ve had over the last few years. 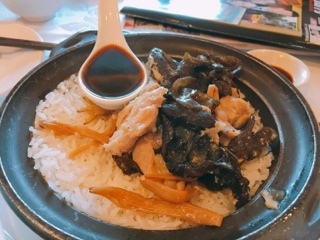 The chicken and mushroom steamed rice (L) is served in the typical clay pot. Despite skimping on the soy sauce (a mere tablespoon), there’s sufficient amounts of chicken, black fungus and golden needle (a Chinese herb) to make up for it. 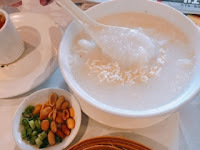 While the mixed meat and seafood congee (L) looks plain, once you dig into the bowl you’ll find a decent portion of fish and pork rind mixed throughout – both white ingredients that simply blends right into the rice. 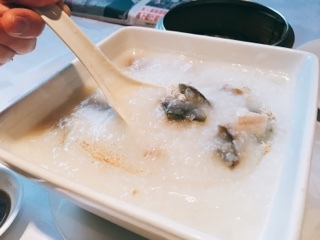 The salted pork and preserved egg congee (L) offers more contrast and I’m surprised by the large pieces of meat and egg within it, it seemed as if every spoon was filled with the ingredients. Fancy’s dessert offerings, on the menu, does seem skimpy with five choices. However, it’s augmented by options pushed around in carts, so you may want to save room for those. 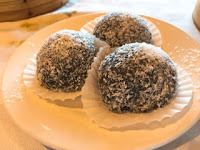 The dumpling with black sesame paste (S) was sweet enough with plenty of coconut, peanut and sugar inside. I loved the sesame casing, which was soft, chewy and fresh. How wonderful it feels to have a place to regularly visit again. I appreciate the short waits for a table and my parents love the small touches such as asking whether you want a newspaper with the meal (complimentary and yours to keep afterwards). It’s friendly and comforting, a restaurant you’ll likely find me at most Sundays, on a going forward basis.